NASA has published an amazing video titled “Sounds of Saturn: Hear Radio Emissions of the Planet and Its Moon Enceladus”. The analyze of the data from the Cassini Spacecraft’s Grand Finale orbits showed a surprisingly powerful interaction of plasma waves moving from Saturn to its icy moon Enceladus. Researchers converted the recording of plasma waves into a “whooshing” audio file that we can hear, in the same way a radio translates electromagnetic waves into music. Much like air or water, plasma (the fourth state of matter) generates waves to carry energy. The recording was captured by the Radio Plasma Wave Science (RPWS) instrument on September 2, 2017, two weeks before Cassini was deliberately plunged into the atmosphere of Saturn. To put things into a perspective, here are the moons of our solar system (including our moon) and their sizes compared to Earth. 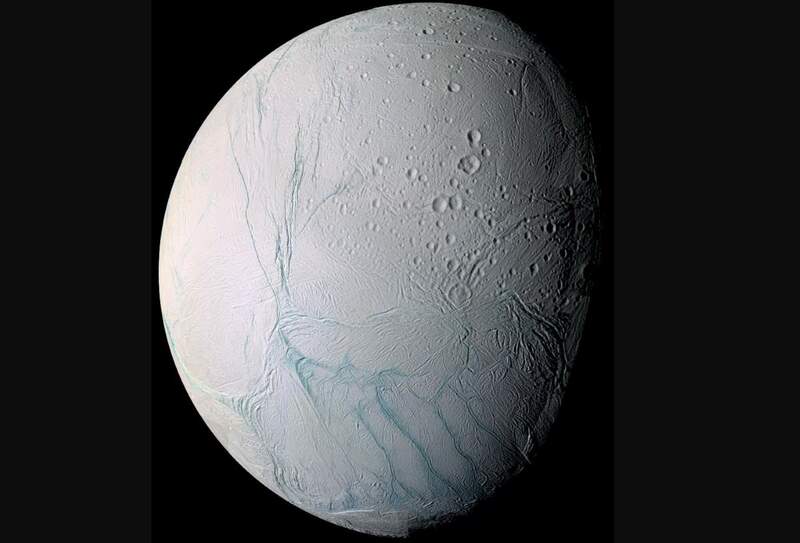 According to a new study, microbes like those found in Earth’s deep ocean could potentially thrive in the underground ocean of Saturn’s icy moon Enceladus. Both molecular hydrogen (H2) and methane (CH4) already have been detected in the plume. Researchers have shown that Methanothermococcus okinawensis, a methanogenic archaeon first isolated from a deep-sea hydrothermal vent on the western Pacific Ocean, can produce methane under conditions known to exist on Enceladus. NASA (The National Aeronautics and Space Administration) has published a video that contains highlights of important events and the space agency’s achievements over the year 2017. Watch: How to tell if a planet harbors life? Are we alone in the universe? Or are there any other “living planets” other than Earth? Until 1992, we even don’t know if there are any other planets around the other stars or not. In 1992, two Swiss astrophysicists, Michel Mayor and Didier Queloz the first “exoplanet” (a planet orbiting another star than the Sun). Then discoveries continued. Especially after the launch of Kepler space telescope on March 7, 2009, which is a space observatory launched by NASA to discover Earth-size planets orbiting other stars, we quickly learned that our Solar System is not a rare phenomenon at all. As of November 2017, scientists have confirmed more than 3,500 exoplanets in more than 2,700 star systems. Now, the question is: are any of these planets (or the planets waiting to be discovered in the future) harbor life? If so, how we can find out? How to tell if a planet harbors life? Currently, we have only one example: the Earth itself. Studying Earth and trying to figure out how we’d conclude the Earth harbors life from a distance (from space) can show us how to find out if a planet harbors life or not. Since 1997, NASA satellites have continuously observed all plant life at the surface of the land and ocean. Launched on October 15, 1997, NASA’s Cassini spacecraft Notes 1 went into orbit around Saturn on July 1, 2004. Since then, it has taken thousands of photos of Saturn, the second-largest planet in the Solar System, its prominent rings, and moons. And on September 15, 2017, Cassini plunged into Saturn’s atmosphere and disintegrated. Here are the 20 most beautiful photos that the spacecraft has sent back to Earth during its 13-year voyage around the gas giant. Cassini was destroyed by diving into the Saturn’s atmosphere on September 15, 2017. This method of disposal was planned to avoid potential biological contamination of Saturn’s moons, since Titan, Enceladus, and other icy moons of Saturn may harbor oceans and alien life.